A mill girl sits on bales of cotton cloth. Whilst she daydreams, the calf has bitten through its halter and wandered off. The subject matter came from local research - in this work we combined Burnley’s industrial and agricultural past -its history of mills and cattle markets. These were shown together in a book about the history of Burnley, for us the theme was epitomised in a photograph of a mill girl feeding her calf. People are invited to sit next to the mill girl, and the calf is a suitable size for small children to play on. 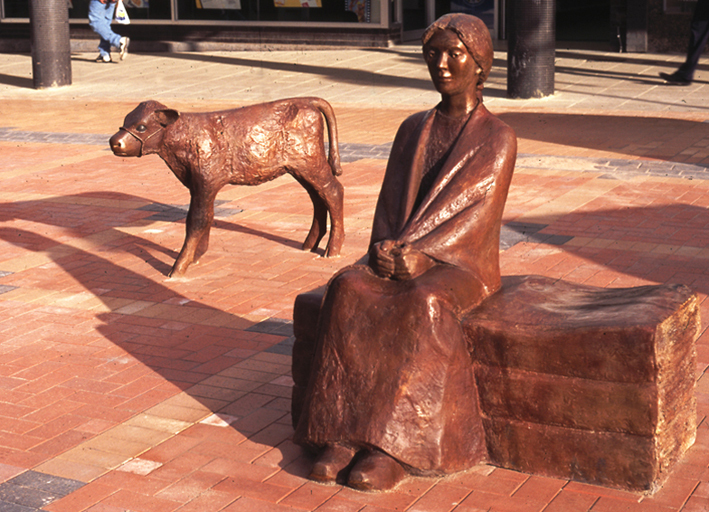 The mill girl was made by Diane Gorvin, and the calf by Philip Bews. Bronze casts by Castle Fine Art Foundry. Installation by the foundry and Philip Bews.